The basket comes together quickly – and looks like patchwork thanks to the fun patchwork ‘cheater’ prints – but would look great in any fun, spring prints. Using the pattern template, cut 2 outside pieces, 2 lining pieces, 2 Fusible Fleece pieces, and 2 Shape Flex pieces. For handle cut two 2″ x 8″ strips from exterior fabric and two 1 1/2″ x 8″ strips from Shape Flex. Before you adhere the Fusible Fleece and the Shape Flex to the backs of the fabric pieces, trim 1/4′ off all the way around each piece. This will reduce bulk in the seams as you assemble the basket. Following manufacturers instructions, adhere the Fusible Fleece to the wrong side of the exterior fabrics and the Shape Flex to the wrong side of the lining fabric. This is optional, but I added some simple quilting lines to the exterior pieces after the Fusible Fleece had been adhered, just to give the bag some texture and to add to the patchwork look. Fold down top edge of the basket where the handle will attach 1/4″ and press to crease. Turn exterior piece right-sides-out and place inside the lining piece. Start by matching up seams and pin two layers, right sides together, all the way around the basket. Starting on the right side of where the handle will attach, sew a 1/4″ seam all the way around the basket top, to where the next handle will attach. Leave a gap there and sew again around to the original side. Tuck lining inside the basket exterior and use an iron to give the basket a good press and help shaping it. Pin all around the edges (make sure the seam is not rolled inside the two layers) and top stitch all the way around the top edge of the basket, leaving an opening again where the handles will be inserted. Making the handle: Fuse Shape Flex to the back side of the two handle pieces and sew both long sides together. Turn right-sides out, press well, and top-stitch along both sides to give the handle a more finished look. Carefully trim away bottom corners to make handle easier to insert. Insert one end of the handle about an inch down inside the opening for the handle. Finish top-stitching over the handle to secure it in place. (If you plan to carry heavy things in the basket, make sure the handle is extra secure. Insert other end of the handle on opposite side and repeat to finish the basket. Just pinch the two sides together at each corner and whip-stitch a few stitches at the corner to pinch those sides together. Use a coordinating thread to camouflage the stitches. Repeat at all four corners. This will give the basket a little more of a box-y look. Either is fine! I also made a bunch of fabric eggs to go in my baskets. I used the wonderful Fabric Easter Egg tutorial from Retro Mama. Her eggs are so pretty. I think I might make a bunch more this year. If you are looking for some of the Wilshire Daisy fabric, I have a bundle in my Etsy shop. Wiltshire Daisy is also available right now from Craftsy. I hope you enjoy this fun little project to get ready for Spring and Easter! Click HERE for the free FULL PATTERN PDF. Imagine how cute this baskets would be in Melissa Mortenson’s new Wonderland fabric available now in local shops and from Fabricworm. Follow Amy Smart’s board Spring Sewing on Pinterest. I love, love, love this little basket. Such an easy way to make it and add the handles! Bravo!! Love the idea of leaving a boxed corner open for pulling through too…will remember that for other projects! Very handy size and shape for use on a dresser or to hold cloth napkins on a table! Thanks friend! Happy spring to you! cute, cute, cute, Amy!! I hope to make some of these this month!!! Thanks for sharing this tutorial!! Blessings! This is too cute!!! I like how you used the patchwork fabric for the outside. Great idea!!!! I just might have to try this with some Japanese fabric then! This is so beautiful. Its probably my favorite project of all. I love how detailed it is. It will be an amazing addition to Easter Celebration. Thank you so much for sharing. Your blog is beautfil and so are your projects! Thank you Amy for this PDF I love this little basket. Unfortunately I couldn’t get the template pattern to come up is there anything that I can do other than making my own pattern up? Hmm… Tell me what happens when you click on the link. Amy that is the cutest little Easter basket and eggs. A really great tutorial too – thanks! I love the little star quilt with the bunnies att eh end too! Thank you for this tutorial! I made one last night and three more planned today. It’s cute as can be and your instructions and photos were crystal clear. Thanks again! I may have asked this already, but…What are the finished dimensions of this project? 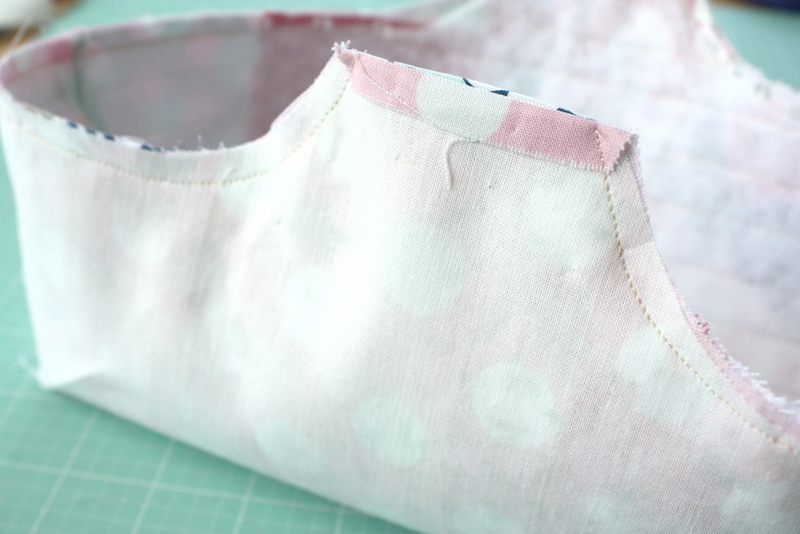 What to Sew for Easter • WeAllSew • BERNINA USA’s blog, WeAllSew, offers fun project ideas, patterns, video tutorials and sewing tips for sewers and crafters of all ages and skill levels.